Survey Snapshots: Would You Trust Automated Network Software Updates? Would you trust your network vendor to automatically update router and switch software? Here’s how Packet Pushers readers responded in our latest Human Infrastructure Magazine survey. Even though you’re working, you still might be procrastinating. Barracuda Networks has released a new DDoS protection service designed to thwart volumetric attacks against Web applications. The service requires Barracuda’s Web application firewall. Ten years of uptime for a piece of equipment is impressive, but it might also indicate significant problems in your IT organization. Here’s why. Fujitsu Network Communications is launching an SD-WAN offering for service providers based on software and appliances from Silver Peak. Cisco’s latest version of ACI allows multi-site connectivity of geographically distributed data centers and adds support for Kubernetes. Do you struggle to balance work and life? Here’s how Human Infrastructure Magazine readers responded to our latest survey. Marvell’s PIPE and 802.1BR Port Extenders – pointless or not ? Do we still need Port Extenders in a whitebox era ? 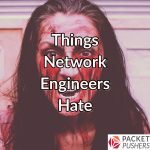 Contextless network requests, stupid network tricks, and the pressures of time. Why do they exist, and what can be done about them? Is there a better name for white box switches? We had a few suggestions for Human Infrastructure readers, and here’s what they picked. Extreme Networks will purchase Brocade’s data center networking assets directly, rather than wait for Broadcom’s acquisition of Brocade to go forward.